Wolves have bulky coats consisting of two layers. The first layer is made up of tough guard hairs that repel water and dirt. The second is a dense, water-resistant undercoat that insulates. The undercoat is shed in the form of large tufts of fur in late spring or early summer (with yearly variations). A wolf will often rub against objects such as rocks and branches to encourage the loose fur to fall out. Wolves are large wild canids. Size: Wolves are 36 to 63 inches in length, they have tails that are 13 to 20 inches long. Wolves weigh 40 to 175 lbs. Wolves stand 26 to 32 inches at their shoulder. Male wolves are typically larger then their female counterparts. Habitat: Wolves are found in Canada and portions of the United States. Description: Wolves are slender, powerfully built animals with a sloping back. Wolves are heavily muscled and they have a thick coat. Diet: Wolves eat deer, moose, caribou, elk, bison, musk-oxen and beaver. Wolves will also eat voles and mice if food is scarce. Senses: Wolves have excellent vision and exceptional hearing. 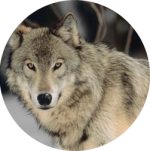 Communication: Wolves communicate using scent marking, vocalizations, visual displays, and body postures. Wolves have a complex vocal communication that consists of: whines, growls and howls. Gestation: Wolves carry their young for 63 days. Birth: Wolves give birth to litters of 4 to 7 wolf pups. A wolf is approximately 1 lb at birth. Sexually Mature: Male and female wolves typically mate for life. Wolves reach sexual maturity between 1 to 2 years of age. Life Span: Wolves typically live 6 to 8 years in the wild, but they can live for up to 13 years. Mortality rates for wolf pups are as high as 50%! Gray wolves can be white, black, tan, brown, or a combination of tans, browns, and black. Social Structure: Wolves travel, hunt and live in packs. A wolf pack contains an alpha couple, that includes a mating pair. Wolves develop strong social bonds and connections. The pack has a social hierarchy. White arctic wolf resting on a rock sticker.